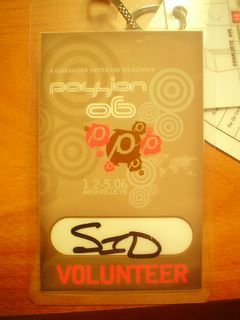 Volunteering at Passion has been one of the pivotal moments in my life. A bold statement to be sure, but it really was an incredible experience. Someone had asked me if I had yet come down after such a week, and it got me thinking that I really had not been up on a mountain top - I have just been changed. I saw so many lives changed this week and saw a true picture of Christ not only in the worship but in the leaders. He spoke through the people that lead the conference: Louie, the Touch team Leaders Kristen and Mike, the arena captains - Radford and Emily, and the second Floor Captain - Pam. All led with such intelligence and passion.